Take 17,190 people per square kilometre, a whole heap of traffic jams and, of course, a pyramid or two, and you’ve officially arrived in Umm al-Dunya. After you’ve dropped your bags at the hotel, join the gang for a welcome meeting. Rise and shine – it’s time to take on Cairo! Not sure where to start? We’ve got two optional activities for you. Take a tour of the Islamic Quarter and check out Red Road, or head out on a day trip to the port city of Alexandria. Before we hit the road to Aswan on our overnight coach, there’s plenty of time to do your own thing in Cairo. Optionals? We’re glad you asked. Take a look around Coptic Cairo or get your barter on at Khan el-Khalili market. After this morning’s visit to a traditional ahwa (that’s ‘coffee shop’ to you and me) we’ve got optional activities a-gogo. Choose from a camel ride, a trip to the Insta-worthy Philae Temple or a visit to a Nubian village. Here, you can even opt in to chow down on a traditional dinner. Hungry? 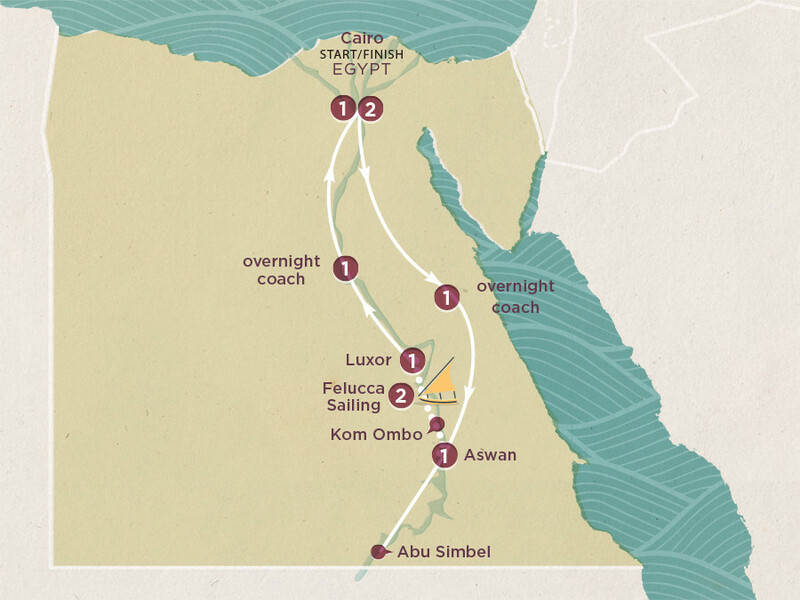 After a temple-filled day at Abu Simbel, we’ll climb aboard a traditional felucca sailboat and hit the Nile. Pull up a cushion – the adventure’s just beginning! Imagine: The sun on your back, the wind in your cotton sails and the best people you could ever hope to meet sharing stories, food and music in one cushion-strewn love-in. Today it’s bye-bye to the boat – we’re stepping off in Luxor, aka the world’s largest open-air museum. But first: a pit stop at Kom Ombo and an optional look at the Karnak and Luxor Temples. Lose yourself in the Valley of the Kings, give a silent high five to Queen Hatshepsut (who ruled ancient Egypt for 20 years) and snap a selfie at the Colossi of Memnon before we hit the road back to Cairo. See King Tutankhamun's treasures at the Egyptian Museum, get goosebumps at the ancient pyramids and play ‘got your nose’ with the Sphinx (never gets old). Then: check out the necropolis of Saqqara. Just getting into the groove of this 24-hour city? The adventure may be over after breakfast, but feel free to stick around!